Happy November! This month is all about being thankful and celebrating the amazing things we have in our lives. I wanted my students to reflect on those very things while continuing to practice their writing. On a whim, I thought of this thankful turkey book so satisfy both the writing process and their thankfulness in a cute plump package! Isn’t he cute? Pin it to save! Like I said above, I was looking for a way for my students to uniquely share their thankfulness in a book that could be sent home and shared with families. My mind started brainstorming different ways to do this and I randomly (seriously, I was sitting on the couch watching something on TV) thought about the feathers and how I could turn them into “bookmarks” for each page. This got me excited and I got to work creating a resource my kids would flip out over. Each feather links to it’s own page in the book, giving my kiddos 6 opportunities to let me know who or what is more important in their own lives. I have a couple of students I will need to differentiate this for, so I will simply omit pages 2 and 7 to make the turkey only have 4 feathers at the end. You can even make it more your own with the editable blank copy, adding your own prompts, sentence stems, or directions! There is a ton of flexibility built into this craft. Work backwards to put your turkey together, from pages 8 to 1, making sure to line up your lines. I reminded my students to stack the numbers on top of each other so the feathers laid the right way. The best way is to start on a flat surface and work backwards. 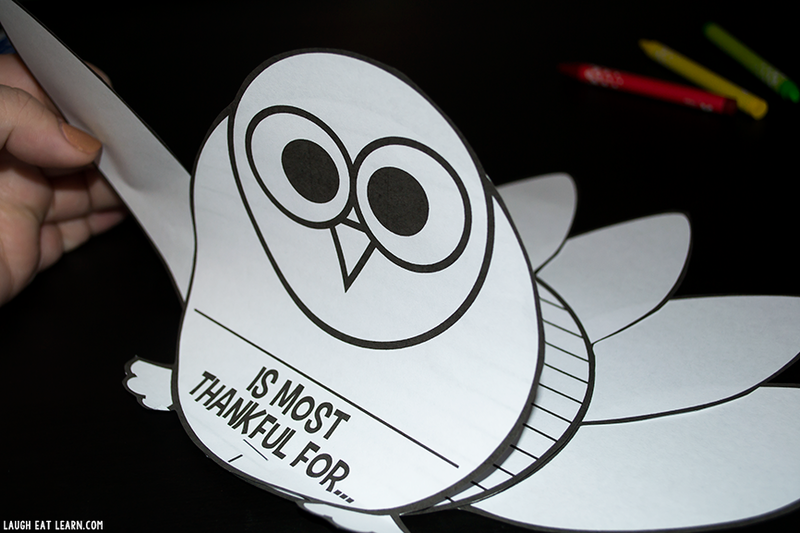 Slide your little guy off the table and staple (or have a great helper) staple the bottom of the book, right below thankful. The booklet is now complete and ready to be flipped through! Now your little birdy is all plump and ready to write in! I encouraged the kiddos to do their best color on the front, label each feather with something they are most thankful and decorate. I’ll probably spend some time with my ELL students discussing and brainstorming some different things on the whiteboard. I also will encourage them to take their time on spelling because this will surely making an appearance at the dinner table before the big feast! Last but not least is to work on the writing and explaining why these people and/or things are important to us. We have been working really hard on creating good, great and even better sentences in my classroom. I would encourage students to continue to use what they have learned in their own writing. I also would practice re-writing the prompt on each page so students know the correct way to answer prompts and questions within their writing. Well, that’s all folks, isn’t that the cutest thing?! I’m curious… What are you doing to celebrate Thanksgiving in your classroom? Do you host a party or celebration within your classroom? I would love to know more about your classroom traditions! If you found this useful and want to share with your other teacher friends, pin the image above and make sure you you follow me on Pinterest for all my fall fun ideas for your classroom! Happy Thanksgiving!